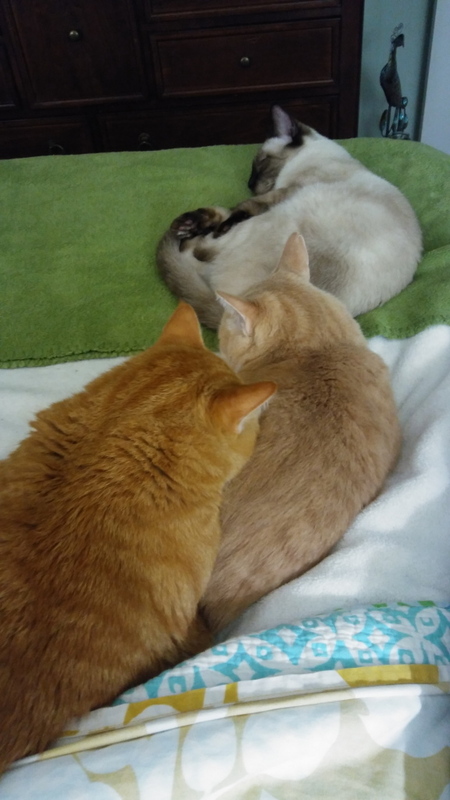 Unfortunately, Chris is way too annoying at night so we have to close our door to all the cats when we go to bed. In Chris’s defense, he is only part of the problem. Frankie will jump on the dresser in the middle of the night and make noise by scratching at the blinds or knocking something over. Floki and Puck are mostly good but now I worry about Puck peeing on the bed since he has done it twice already and pooped on it once. This means that somebody has to be the bad guy and kick out all the non-humans. That bad guy usually ends up being me. 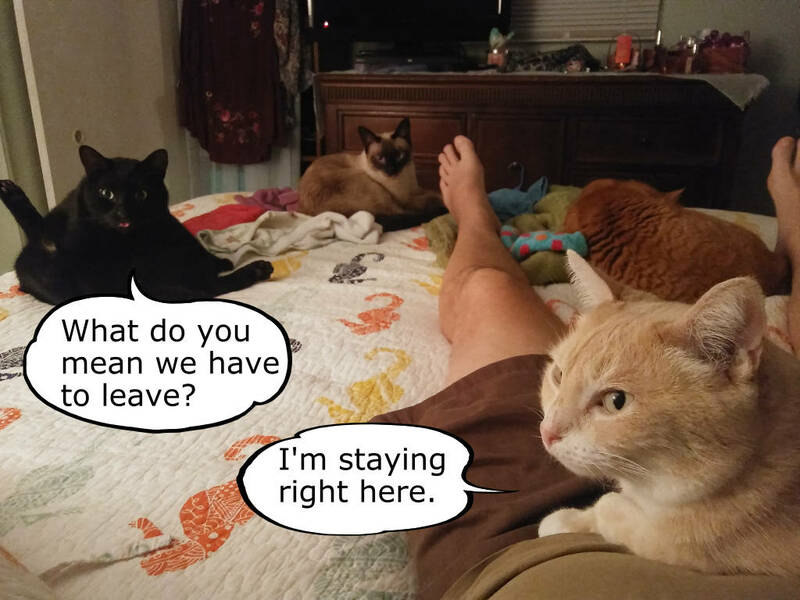 This entry was posted in Uncategorized and tagged bed, Cats, cute, funny on February 2, 2018 by Charles Huss. 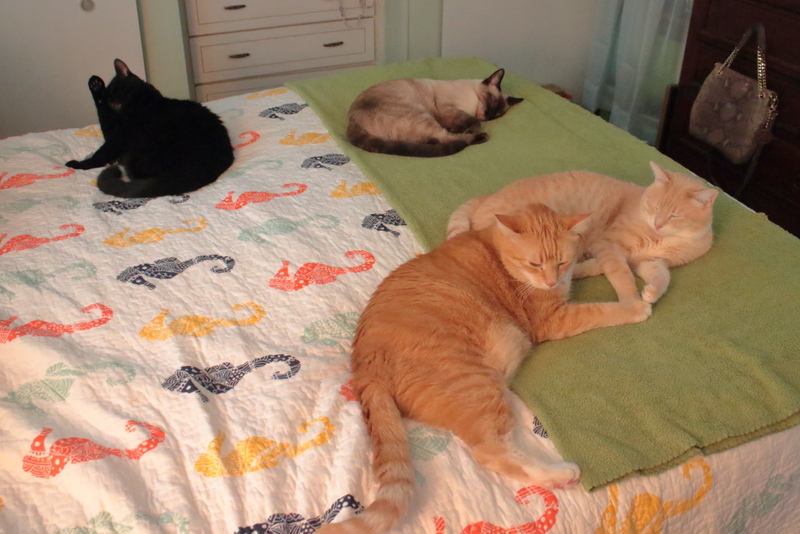 The weather has cooled here recently and all the cats want to hang out on the bed more than ever before. 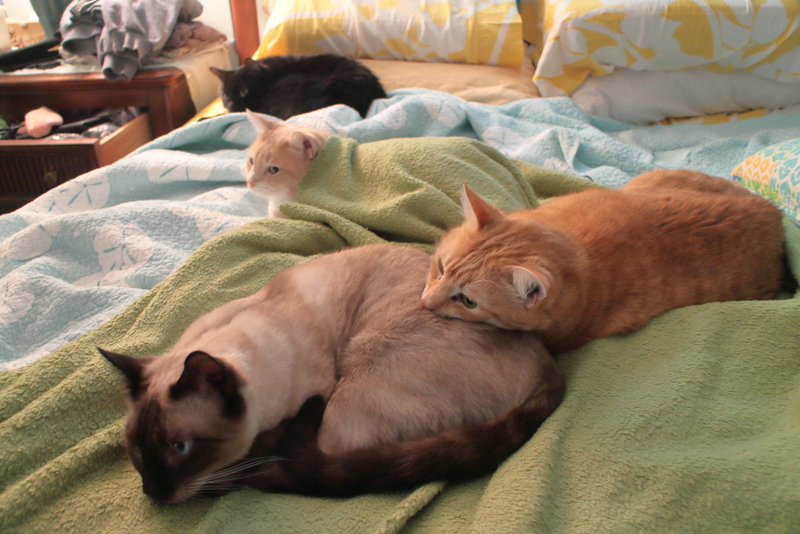 I don’t know if the bed is warmer or if it is just a good place to gather and preserve body heat. Maybe after sleeping on it all night we warm it up for them. 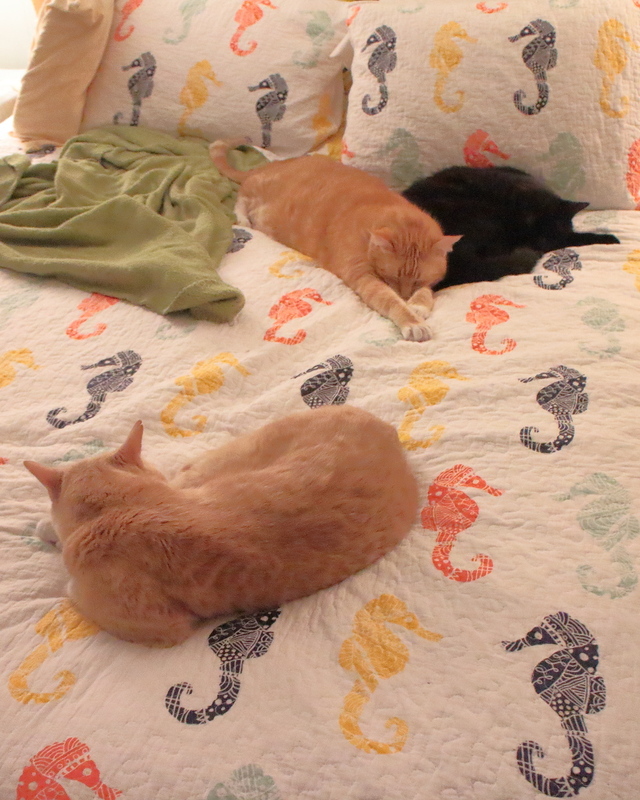 This is the closest I have ever seen all four of our cats. 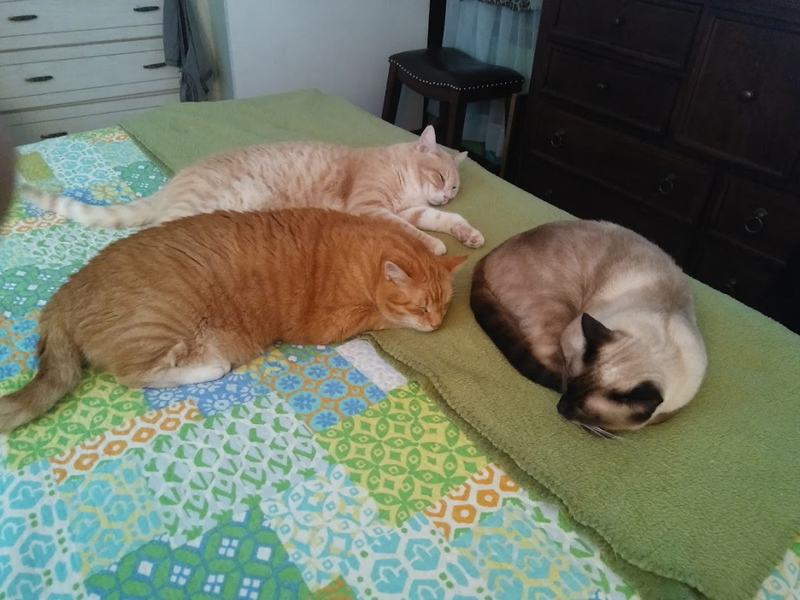 They often show up on the bed after their breakfast (which is before our coffee) and I feel bad about kicking them off to make the bed. 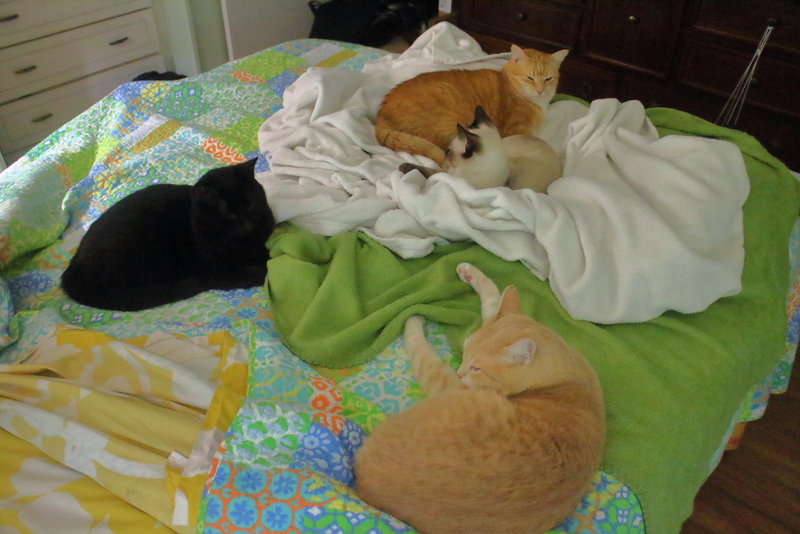 This entry was posted in Uncategorized and tagged bed, Cats, cold, cute, group on December 15, 2017 by Charles Huss. 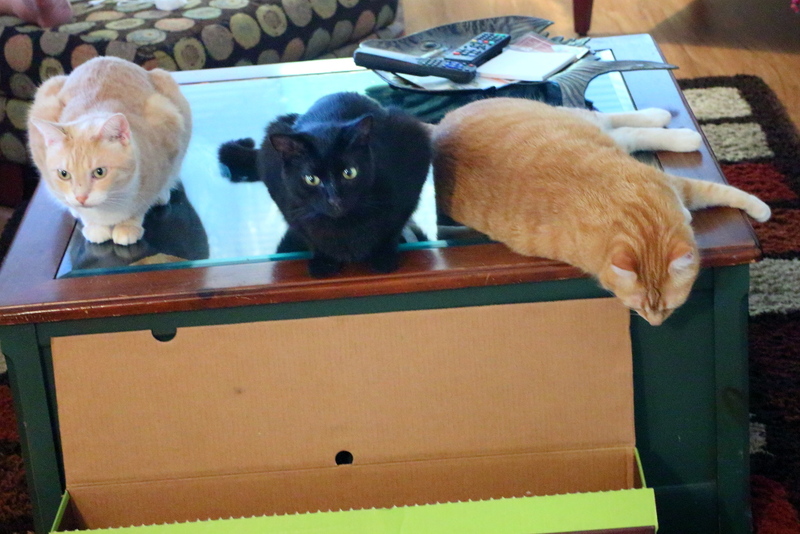 This story happened on Monday of last week and involves three bad cats. That morning happened to be the coldest this season and I was tired and I didn’t want to get up at 3:15 in the morning to chase Frankie around the neighborhood. I knew he would come back so I tried to go back to sleep but him being outside bothered me so I eventually dragged myself out of bed, put on some warm clothes and a jacket, and went out to look for him. The Jacket I had on was a Florida jacket and didn’t come close to fulfilling its job of keeping me warm. I walked around the area for 15 minutes looking for Frankie but eventually got too cold and had to go home. 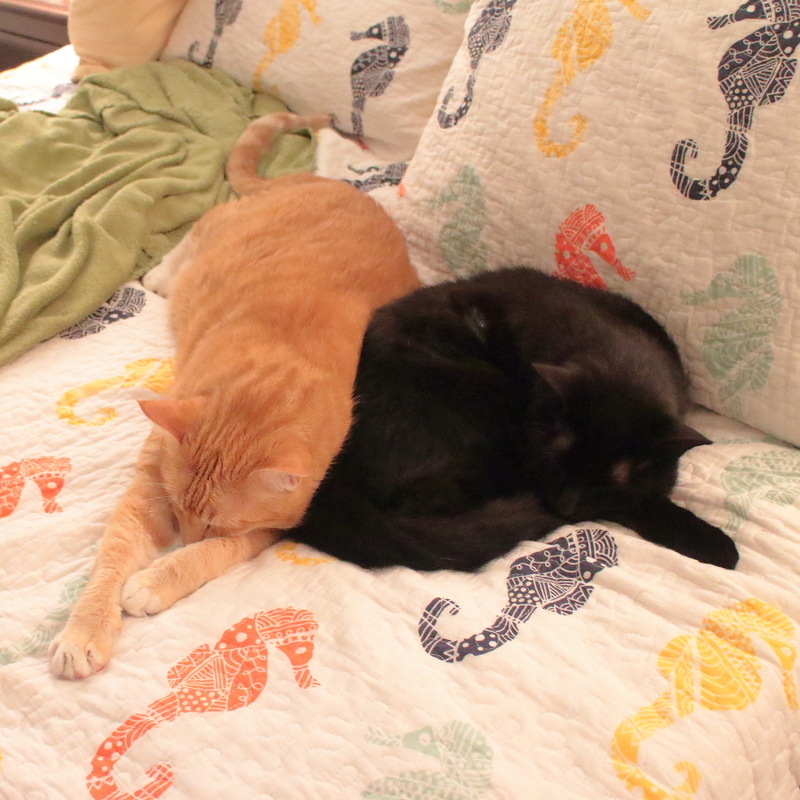 I decided to go back to bed because I was very tired but now Chris and Puck were on the bed. I just left them there and got into bed. Everything was fine for a short time and I almost fell asleep but then Chris started bothering me. He positioned himself next to my face and started licking and biting my nose. When I turned my head away, he started digging his claws into my neck and the back of my head. I tried pushing him away but he kept coming back. Eventually, Rose heard what was going on and came in to help. 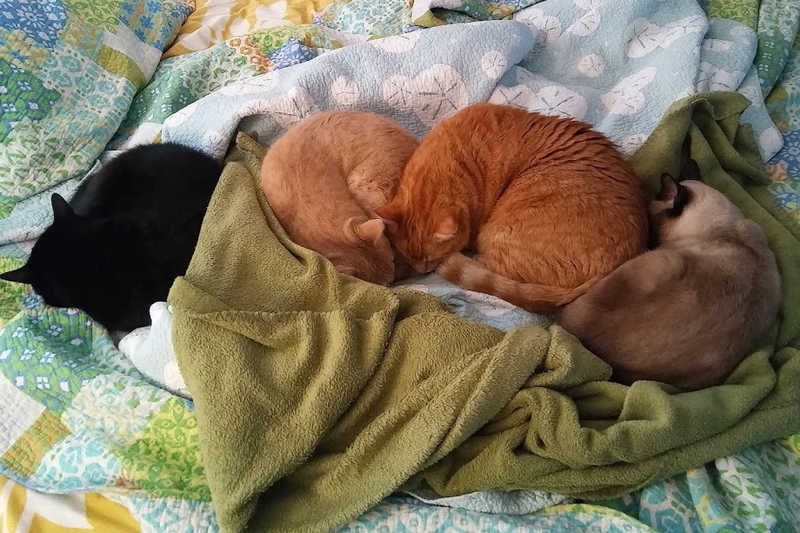 She removed all the cats from the bedroom and closed the door so I could go back to sleep. After a little while of trying to go back to sleep, I heard the door open and I heard Rose say, “Come inside you bad boy.” Frankie was back. That made me feel better but I had another problem. Just before or just after Frankie came back, I don’t remember, I felt Puck get on the bed. 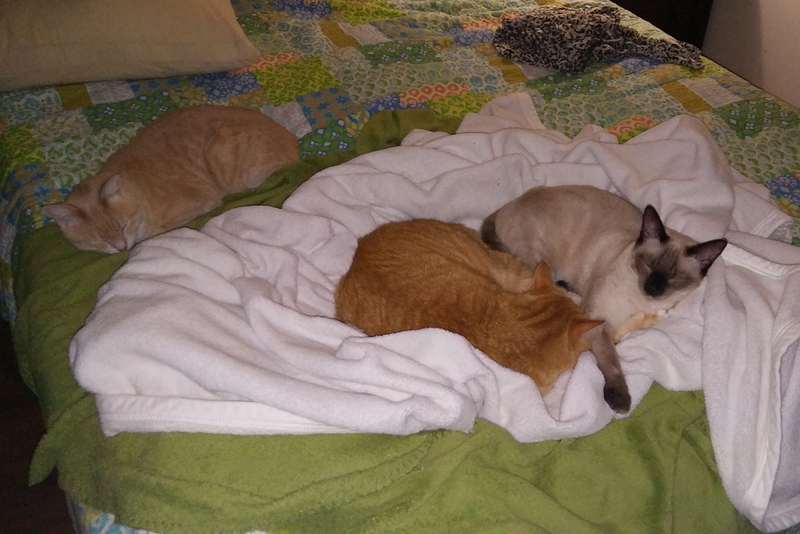 Appearently, Rose did not remove all the cats from the bedroom. That concerned me a little because the last time he was trapped in the bedroom he peed on the bed and on me. I tried to put that thought out of my mind but before too much time passed I felt a very warm feeling against my leg. He did it again! He peed on the bed! And he peed on me! That woke me up fast. I got out of bed and gathered up all the sheets and threw them outside to be washed. Then I got in the shower before I did anything else. Fortunately, we had a mattress cover on the bed which protected our mattress and our expensive foam mattress pad. I replaced the sheets and blanket with a new set and I put the other ones in the wash. Washing clothes in our house is a step-by-step process. I might put a load in the washing machine in the morning before I go to work and then put it in the dryer when I get home. We have a high-efficiency washer and dryer but the dryer is not very efficient. Even at the driest setting it never dries on the first try. Since the machines are outside, I never hear the buzzer when they’re done so I always have to remember, which is something I am not good at. Sometimes it will take a full day or more to wash, dry and remove clothes from the dryer. Eventually, I got everything out and folded but decided to wait until we changed the sheets, which we always do on Saturday morning, before putting the mattress cover back on. Bad decision. Friday morning Rose got up to use the bathroom and all the cats busted through the door when she opened it. This time it was a more reasonable hour. It was almost time to get up anyway. 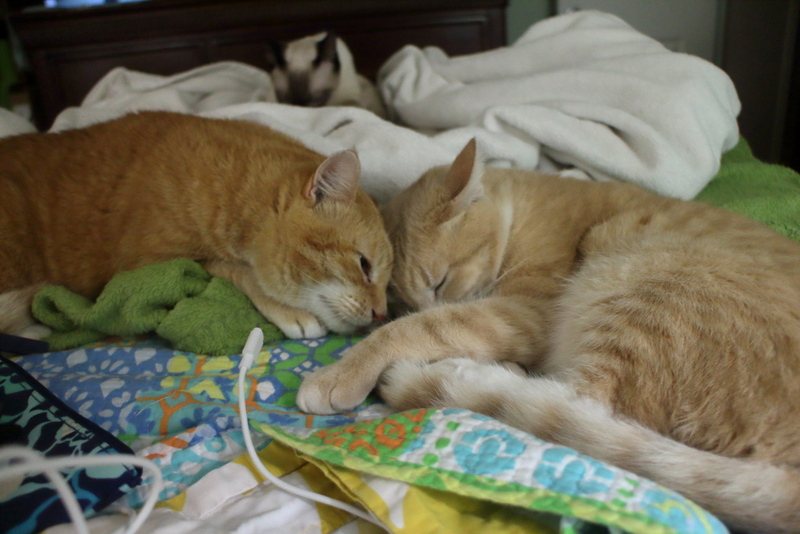 Chris and Puck jumped on the bed like they usually do while I waited for Rose to get out of the bathroom. When I got up and walked towards the bathroom I touched the foot of the bed for some reason and noticed it was wet. Puck peed on it again! I couldn’t believe it. He was only in our room for two minutes. This time there was no cover to protect the bed. I pulled the sheets up and I pulled up the mattress pad and noticed some of the pee had gone down through four inches of foam into the mattress. I was able to save the mattress with some urine eliminator but the mattress pad was a goner. The rest of the story is only appropriate for an R-rated blog. This entry was posted in Uncategorized and tagged annoy, bad, bed, Cats, escape, misbehave, pee on November 28, 2017 by Charles Huss. 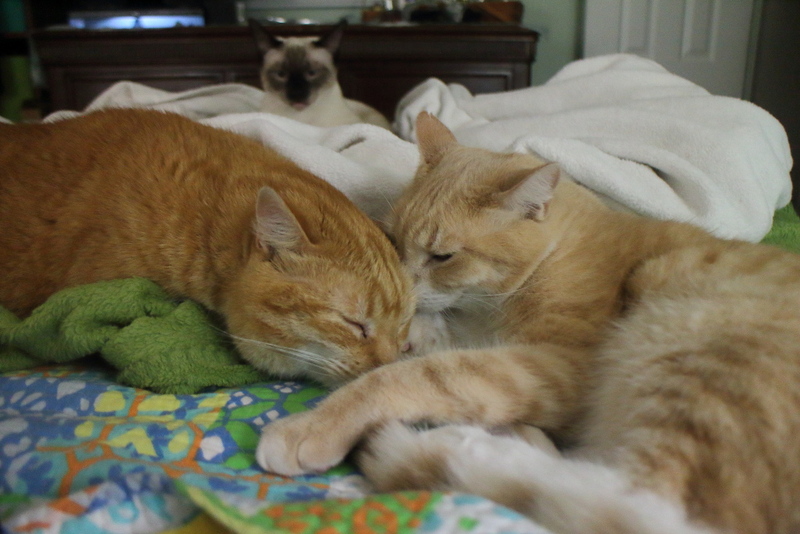 This entry was posted in Uncategorized and tagged bed, Cats, cute, funny, kitten, tongue on January 13, 2017 by Charles Huss. We don’t get cold weather very often in the Tampa Bay area, but when we do, it’s during the weekend. Saturday morning started out at 70 degrees but dropped all day until Sunday morning when it was 36. It was cold Sunday too and currently, at 8 a.m. Monday morning, it is 41 degrees, but it will improve throughout the work week, of course. We have an old heater and don’t trust it so we leave it off at night, which means our bed has extra blankets on it to keep us warm. That does not go unnoticed by our cats who congregated there most of the weekend. 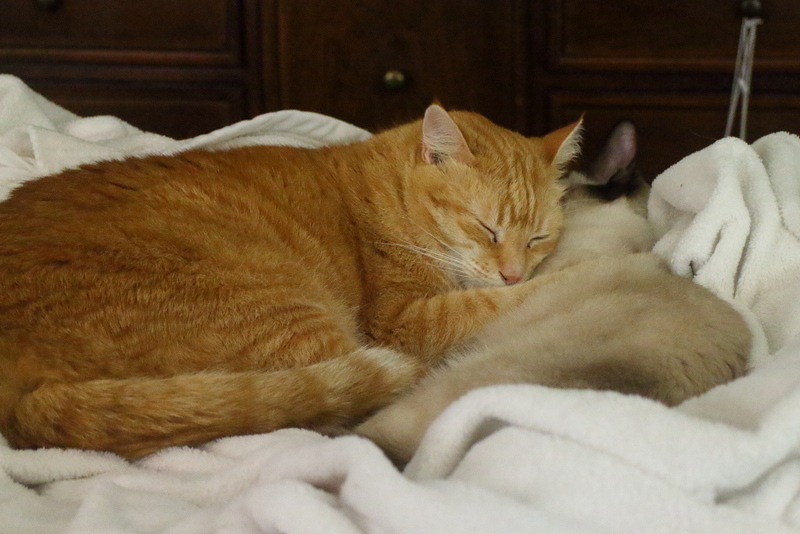 Where do your pets go on a cold day? 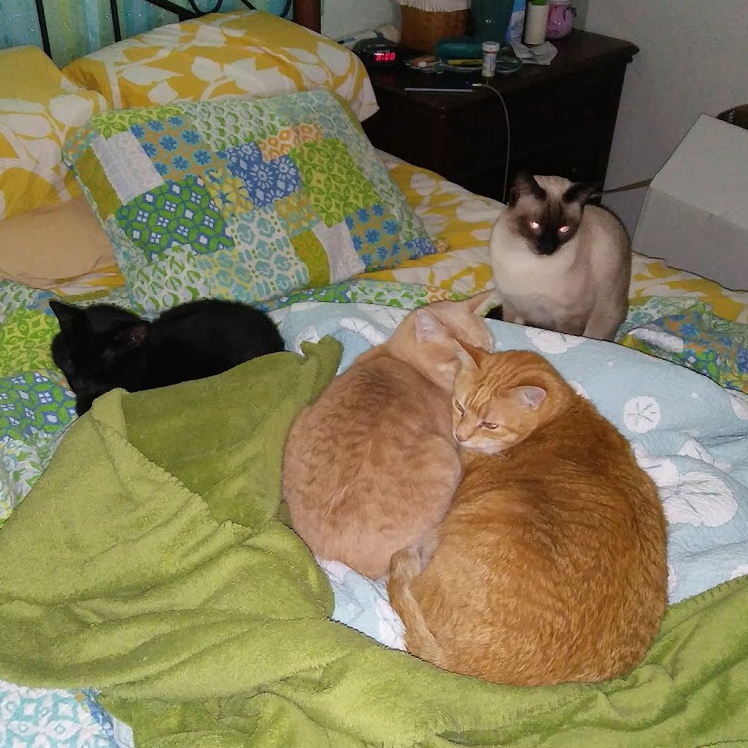 This entry was posted in Uncategorized and tagged bed, blanket, Cats, cold, cute, Pets on January 9, 2017 by Charles Huss. 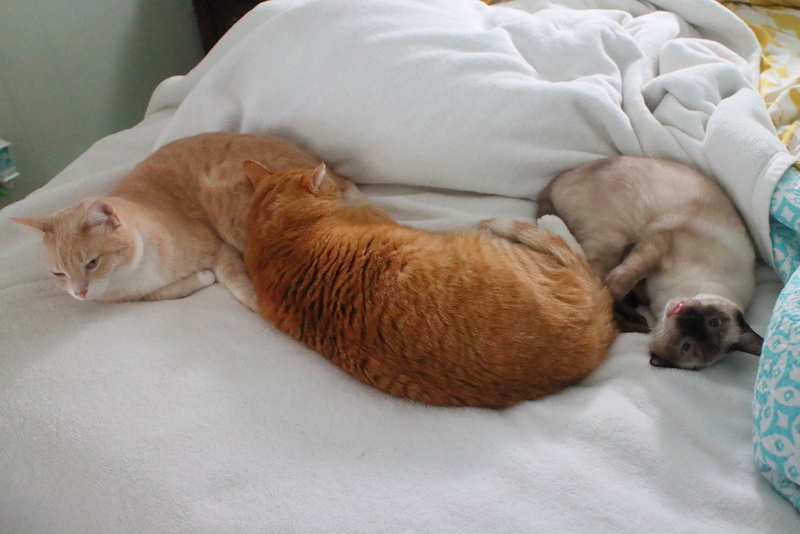 I’m sure almost everyone reading this understands the difficulties of making the bed with cats around. In my house, it is usually Chris who wants to be covered with a sheet or blanket, but the other day Frankie ended up under the sheet. 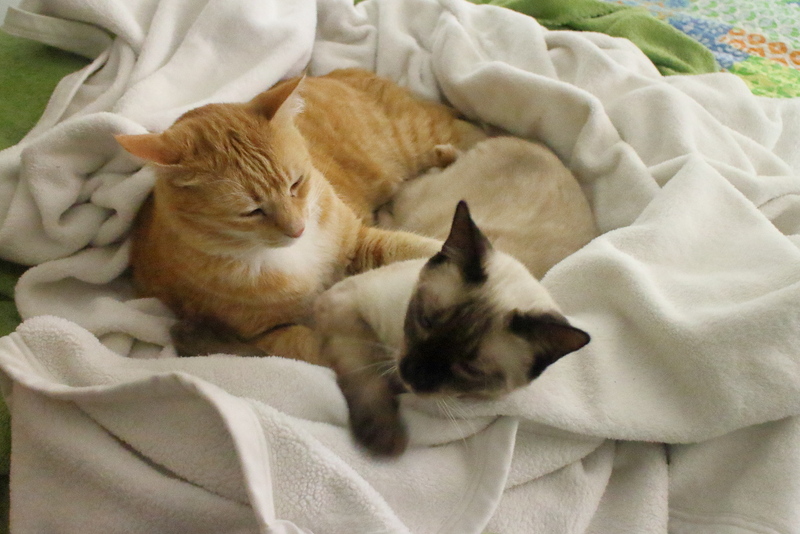 When Puck saw them up in the sheet he got all frisky and started attacking Frankie. It’s funny to watch those two sometimes. Often we will see Frankie chase Puck through the house and a few seconds later we will see Puck chasing Frankie. It usually seems friendly but there are also many times when someone loses a big chunk of fur. This entry was posted in Uncategorized and tagged bed, cays, cute, fight, funny, sheet on May 25, 2016 by Charles Huss. The Horrible Result of Puck’s Self-Imposed Exile. 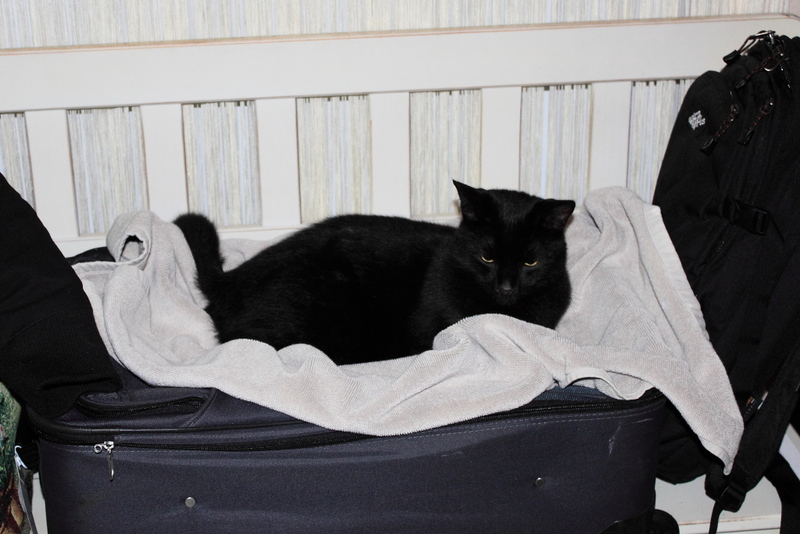 Recently I wrote about Puck’s Self-Imposed Exile when my stepson came for a week at Christmas. He was so fearful that he stayed in our bedroom whenever Nick was in the house. Puck had no problem coming out to visit Rose’s Dad and his wife when they came at Thanksgiving or my best Friend, Rick, when he came here on New Year’s Eve, but for some strange reason, he decided he was afraid of Rick when he came to visit on Friday. Rick spent the night on our sofa and Puck spent the night in our room, afraid to leave. I woke up early Saturday morning while Rick was still sleeping. I worried that Puck needed to use the litter box by then so I carried him to the patio and put him in the box. I tried that when Nick was here and got scratched up from Puck trying to escape my grasp out of fear. 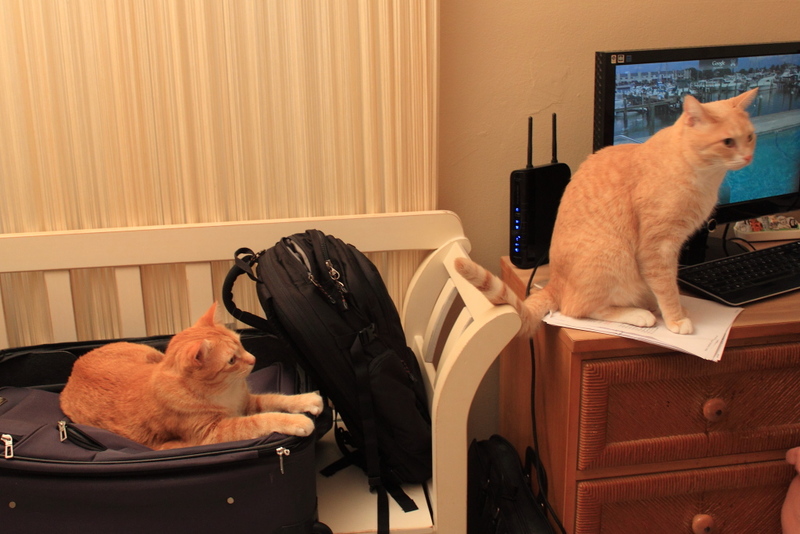 This time I made it all the way to the box and Puck just seemed slightly nervous. He stayed in the box for a couple of seconds and then jumped out and ran back into the bedroom. I assumed he didn’t have to go so I didn’t worry about it after that. 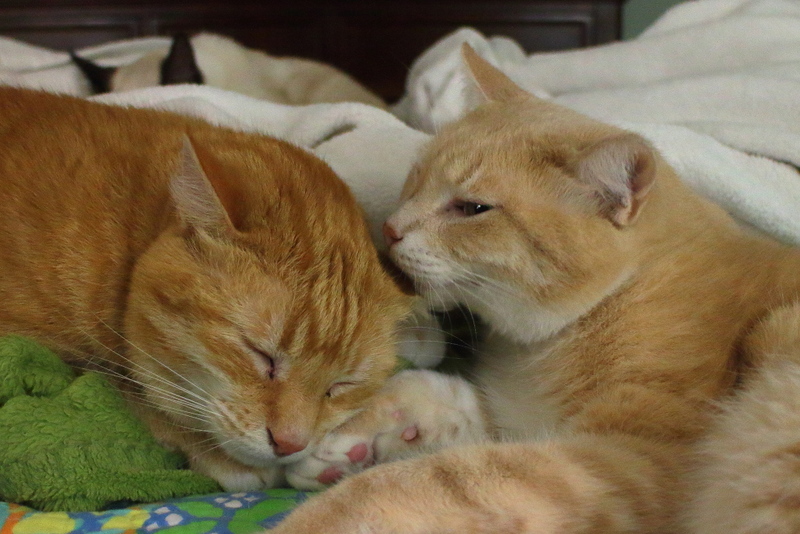 A little while later Rose was awake and complained that Puck either farted or he pooped somewhere in the bedroom. Normally, Rose’s nose is about twenty times more sensitive than mine and I usually smell nothing while she is acting like the world is about to end, but this time I smelled it too. I looked around the room and as I was doing that, Rose told me she didn’t want me to use the bed sheets again because they keep popping off. “Okay'” I said, concentrating more on finding where Puck might have pooped. I checked the entire floor, including all the nooks and crannies. “I don’t see anything,” I said. “Oh my God! It’s on the bed!” Rose suddenly yelled. I hurried into the kitchen and pulled a few paper towels off the roll and wet them. “Here,” I said, handing her the towels. As I was wiping it off I had visions of thirty years in the future. “There, it’s off,” I said as I threw the paper towels into the trash bag I brought with me. That is when she noticed another big spot of poop on her leg and the process started again. The next priority was to pick up the poop off the bed. I had brought a roll of paper towels into the bedroom along with a small bag for garbage but the task was just too gross. Luckily, I remembered Rose didn’t want to use those sheets anymore so I just rolled them up and stuffed them into a garbage bag and took them out to the garbage can. Puck got over his fear of Rick shortly after that, thankfully, and we now have something to look back on and laugh at but Saturday morning there was no laughing going on in this house. After the commotion, I put a sheet on the bed to protect it while I washed the mattress cover. That is when Chris and Frankie came in to see what all the trouble was about. 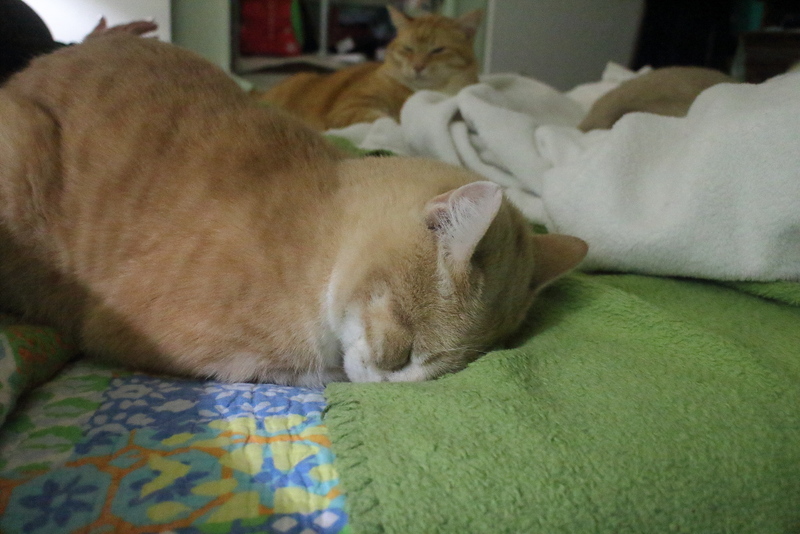 This entry was posted in Uncategorized and tagged anxiety, bed, Cats, fear, poop on January 10, 2016 by Charles Huss. Tomorrow is moving day and Puck is blissfully unaware. 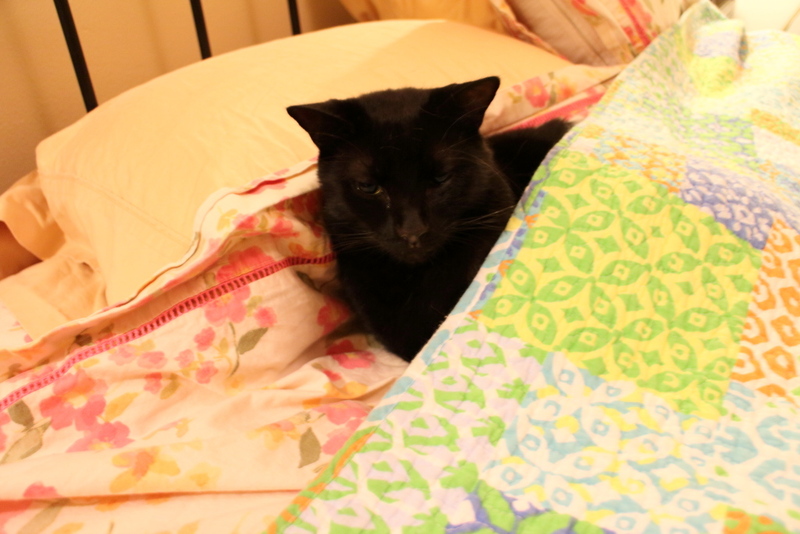 This entry was posted in Uncategorized and tagged bed, black cat, cat, cute, sheets on May 22, 2015 by Charles Huss. The other day my stepson Nick flew down from Massachusetts to visit us for the Christmas holiday. Of course, bringing new things into the house is like a cat’s version of a new attraction at Disney World. Nick’s suitcase was of particular interest. 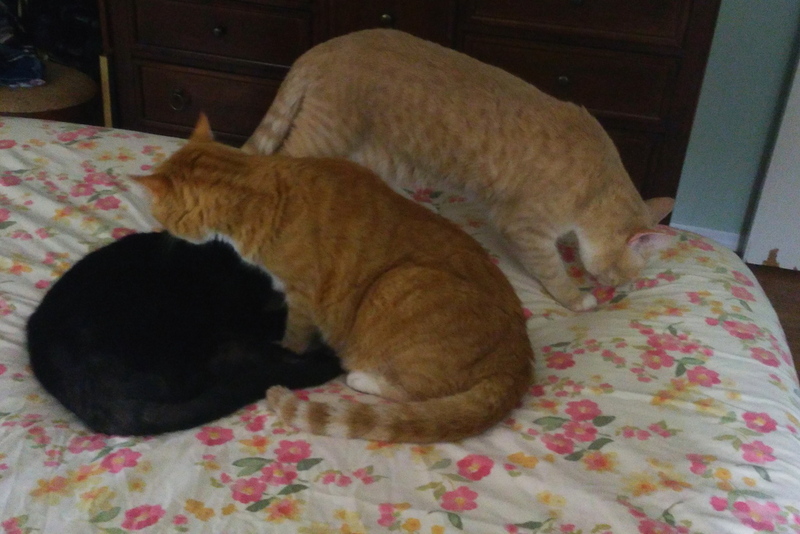 They all had to take turns laying on it like it was their own personal bed. Then Frankie was distracted by Rose bringing food into the room and Chris took over. 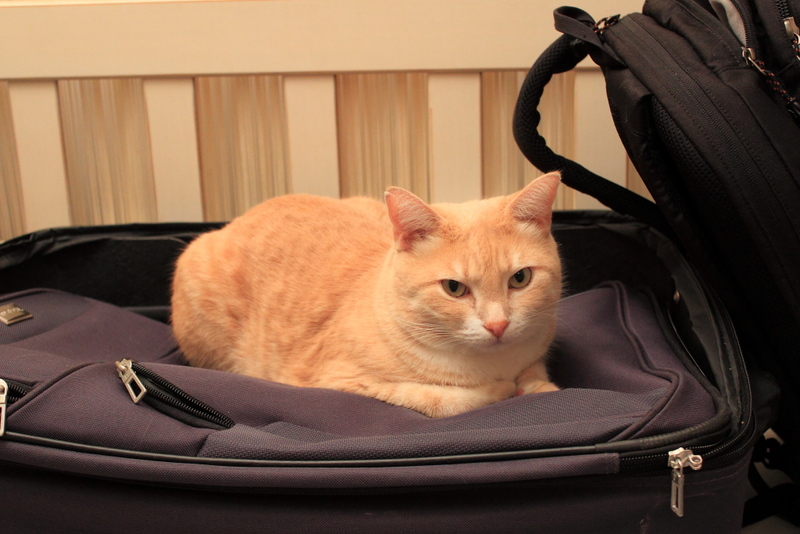 After Chris got down Rose put a towel on the suitcase to keep the cat hair off. That is when Puck became interested in it. Now that they have all had a turn, I wonder what will grab their attention next. 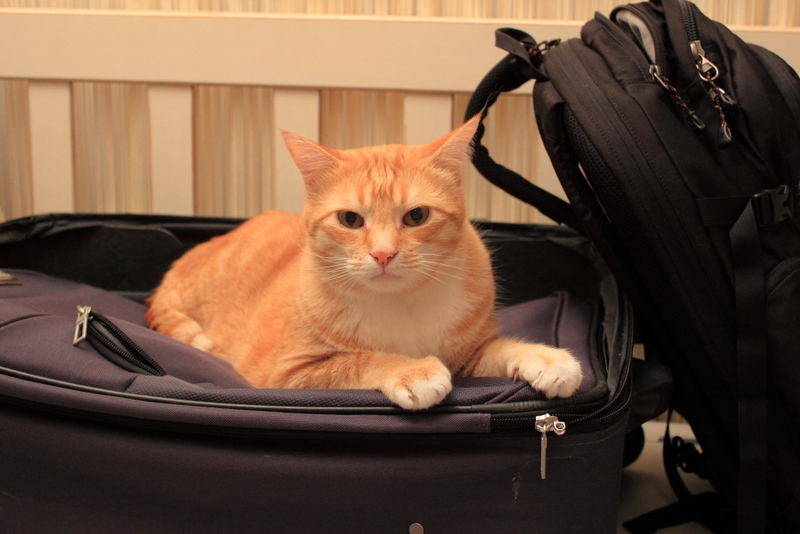 This entry was posted in Uncategorized and tagged bed, Cats, luggage on December 23, 2014 by Charles Huss.